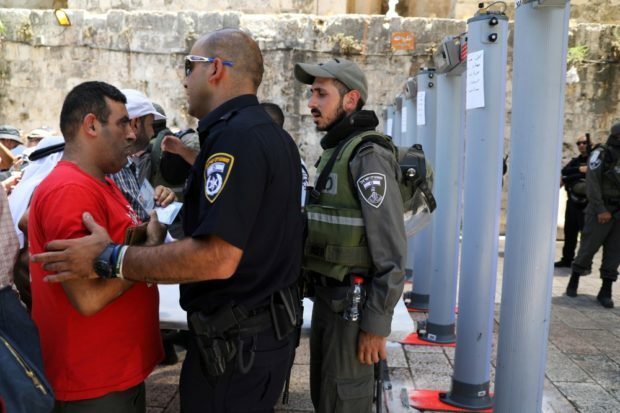 The decision by Israeli authorities to reinforce security measures near the Al-Aqsa mosque following the killing of two policemen last week has been unwelcomed by Muslims in the area as well as Palestinian authorities. Fatah described the move as “terrorist procedures” imposed by the Israelis and also accused the authorities of carrying out “fierce and organized attack” on residents of East Jerusalem. Muslims have refused to pass through the metal detectors placed at the entrance of the gates to Al-Aqsa and preferred praying on the outskirts. They argue that abiding by the new security measures will reinforce Israel’s questioned sovereignty claim over the area. The body responsible for administering the al-Aqsa mosque, al Waqf Trust, denounced the measures. It called for the rejection and boycott of “all the Israeli aggression measures, including changing the historical status quo including imposing the metal detectors.” It also supported prayers at the gates of the mosque and in the streets of Jerusalem until the metal detectors are removed. Written by: Peter Mulvany on July 18, 2017. Posted by Peter Mulvany on Jul 18 2017. Filed under Headlines. You can follow any responses to this entry through the RSS 2.0. Both comments and pings are currently closed.